As a website owner, you should take web security very seriously; not just for your sake but for your customers also form an integral part of it. Even when a website doesn’t incorporate any crucial data, there is still a high risk of the site being hacked. Mostly, hacking is not about damaging the website or data breach; rather it is an attempt to use the servers for spam email communication, transfer illegal data, set up a temporary server, and many more unlawful activities. To ensure that you don’t become a victim of these false acts, let’s learn how you can tighten the web security of your page. Companies may have more than one website with them and each of the domain might be running on different technologies, managed by different teams. So, before you begin planning your web application security strategy, you need to sort what you own, and then prioritize your investment accordingly. Prior to everything else, start by gathering all the information about your web pages like the number of sites, technology used, hosting plans, types of data stored, etc. This will allow you to plan your web security in an organized and clutter-free process. While it seems like an obvious step, keeping all the software update is imperative for web security. Hackers are looking for loopholes in the systems and when there are outdated software and operating systems present, they will not waste time to attack your site. Besides, hacking these days is often automated where bots are constantly scanning the sites and looking for opportunities to intrude. People often underestimate the importance of strong passwords in their sites. A good password practice for users account will allow you to efficiently secure their account data. While the users generally don’t like complex password procedure, imposing requirements like including lowercase, numbers, minimum eight characters, etc. will safeguard their information in the long run. 4. Is Your Site HTTPS? HTTPS is a protocol which offers security on the internet. When users visit an HTTPS site, they are entering a secure server where no third-party can intersect or change the content of the page. Also, if your users are sharing private data like credit card info, addresses, login details, etc., then it is recommended to use HTTPS for optimal web application security. Though CMS applications are easy to use, from a security point of view, they tend to be extremely challenging for the end users. Many of the automated cyber-attacks today rely on the default settings. So, a large number of these attacks can be saved merely by changing the CMS default setting during the installation process. Everything present in the virtual world can be lost in one catastrophic incident, thus always have data back-ups. 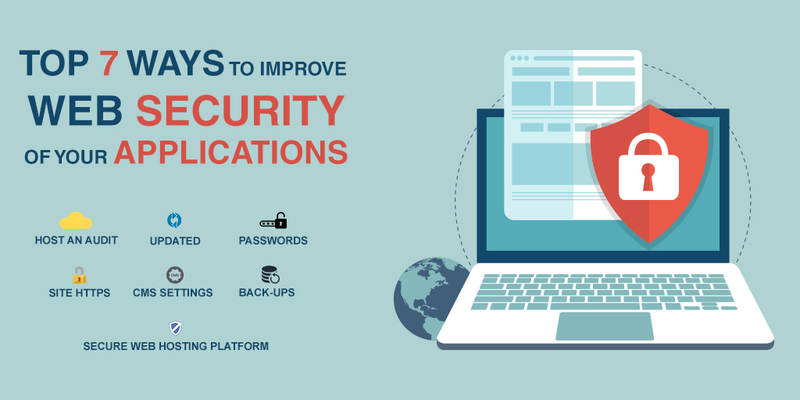 Generally, websites don’t tend to have enough back-up with them but proper investment in this aspect can truly enhance web application security. Some popular CMS programs offer plugins and extensions that allows automated backup for your website, thus eliminating the need to manually backup the database. If you are using a shared web hosting platform like Bluehost, Inmotion, GreenGeeks etc., you rely on the provider for your web app security. In this case, you must inquire about every single element like intrusion detection system, firewalls, and what security measures they avail to secure the shared sites from each other. On the other hand, if you are using a private server or own an internal server, then you need to question yourself, how secure is your network? Similar to the software, servers also need to be updated frequently to ensure they remain safe to be used by users. There you have it, some easy steps that will ensure maximum web app security. If you can manage to execute them properly, you can ward off any threats from hackers or unauthorized elements from your website. In fact, providing a secure platform is always going to be challenging, but using the most effective security practices will allow you to mitigate the risks.